Hakone is one of the most popular areas near Tokyo. It’s a great place to head for a day trip and there are many things to do. There are various places to visit, and the area itself is fairly vast. It can take a lot of time to get around and do everything, so as a day trip, it can be a little tight. I would recommend at least two days and one night, that way you can at least experience a ryokan or an onsen. For those that don’t know, a ryokan is a traditional style Japanese Inn. It’s similar to a bed and breakfast, with a twist. Usually, your room is a typical tatami room with futons on the floor. You are served a traditional dinner and breakfast, so this can be a little scary if you aren’t used to raw fish, rice, and sleeping on the floor in a room full of people. There are several western friendly hotels in the area as well, and almost all of them feature an onsen. Onsen are Japanese style natural hot spring baths. It’s almost always separated into men and women, and the bathing rooms can be as detailed and large as a spa, or as small and simple as a large private bathroom. It really depends on the hotel. All in all, it’s a great experience, and something you can might want to try while visiting Japan. When heading to Hakone, there are a couple of routes to take. If you are lucky enough to have a JR Pass, taking the shinkansen to Odawara Station is probably the easiest way. Otherwise, most people would take the Odakyu lines from Shinjuku. Odakyu offers a two day Hakone Free Pass, which is great if you are spending two days there. Otherwise, just go for single tickets. There are tourist booths that have English speakers inside the station, so don’t worry too much about buying tickets. The ticket machines also have English instructions. Once at Odawara Station, you have to switch to the Hakone Tozan Train. 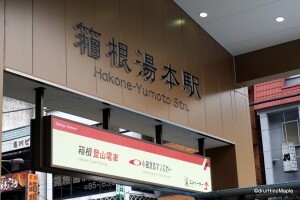 If you take the special express train, which costs more, you will probably go all the way to Hakone Yumato Station. Otherwise, you’ll have to change at Odawara, and again at Hakone Yumato. 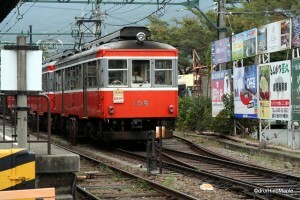 From Hakone Yumato, you will board the original Hakone Tozan train. This is a small mountain line that makes its way slowly up the mountain. It can be extremely beautiful in November with the beautiful autumn leaves, or even in the spring when the hydrangeas are in full bloom as both sides of the tracks are lined with trees. The first stop on the way to Hakone should be at Chokoku no Mori. This is the second to last stop on the line heading into Hakone. This is the home of the Hakone Open Air Museum. If you need instructions, you should call it the Chokoku no Mori museum as that’s the Japanese name. This museum opened in 1969 and has over 70,000 square metres of open space. It’s built into the side of the mountain and the museum itself is spectacular. 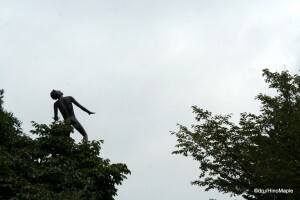 There are several permanent exhibits and also several rotating sculptures within the museum grounds. Almost everything is interactive. You can almost touch each sculpture. There are some pieces of art where you can enter them, play on them, and of course contemplate the meaning of them. If you love taking photos, this place is great and it’s easy to spend a couple hours here. Be sure to bring a few snacks when you get hungry. There is also a nice little foot bath where towels are just 100 yen each. It can make a nice little souvenir, and the bath water isn’t bad. Be sure to check out all of the buildings, and if you have kids, bring them too. There are a few places where kids can just play for hours on end. The only problem is the weather. Try to go on a sunny day and you’ll be treated with a great experience. If you head to the next station, Gora, you’ll be able to enjoy a nice little park, some places to eat, and an opportunity to do some glass blowing. Do note that you must pay to enter the park. This area itself isn’t that interesting. The food can be delicious, and there are several souvenirs to buy, but unfortunately, I didn’t have a chance to really look around. The weather was terrible when I went. I only had a chance to try one of the small local shops. There is a delicious tonkatsu shop, breaded and deep fried chicken cutlets, made from black pigs. It appears to be a specialty and there is always a lineup whenever I’m there. It’s a little pricey, but it’s delicious. Do note that the wait can be over 30 minutes to get in, especially if you have bad timing. While Gora is a good place to stop and have lunch, you can always take the cable car that is connected to Gora Station and head up to Souzan. Taking the cable car is a nice simple journey. It isn’t very steep, but there are several stops along the way. 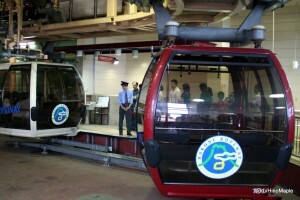 Unfortunately, there is almost nothing to do at the top of the cable car, aside from going to the gondola. If you are making this a day trip, you might want to think about heading back at this time. Thankfully, there are still things to see and do on the way back that had been missed on the trip out to Souzan. Along the cable car route, there are various hotels and ryokans that you can visit and spend a night. 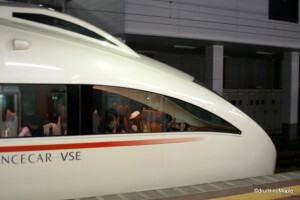 Otherwise, you should head back and take the Hakone Tozan, get off at Miyanoshita and you will be at the Fujiya Hotel. While I have never visited this hotel, it is a famous hotel. It is expensive but it offers a nice dining experience and a few other touristy treats. There is a nice onsen inside and the area of Miyanoshita has various shops where you can buy Japanese style fine china. If you head back to Hakone Yumoto, you can take a bus for 30 minutes and visit the Little Prince Museum in Hakone. This is a museum based on the author of “The Little Prince”. It’s a famous French book that Japanese people love. The museum looks nice, but as with many things around Hakone, I didn’t have a chance to visit this museum. It is fairly popular with Japanese tourists, and from the pictures, the museum itself looks beautiful. If you have a two day free pass, it’s probably worth a quick visit. This is part one of a two part series. To continue reading, please head over to Part II. This entry was posted in Kanto and tagged Chokoku no Mori, Fujiya Hotel, gondola, Gora, Hakone, Hakone Free Pass, Hakone Open Air Museum, Hakone Toazan Train, Hakone Tozan, Hakone-yumoto, hot spring, hot spring bath, Japanese Inn, Kanagawa, Little Prince Museum, Miyanoshita, Odakyu, Odakyu line, Odawara, onsen, ryokan, Shinjuku, Souzan, The Little Prince, tokyo, Tokyo-to, yumoto, りょうかん, 小田原, 小田急, 新宿, 東京, 温泉, 箱根, 箱根湯本, 著国の森 by Dru. Bookmark the permalink.